"No matter how it ends up, we're going to go down fighting." Other Stars: Stephen Furst, Bill Mumy, Jason Carter, Jeff Conaway, Patricia Tallman, Ed Wasser, Wayne Alexander, Wortham Krimmer, Walter Koenig, Efrem Zimbalist Jr.
To have a long-running series that tells a coherent, preconceived story is quite the novelty; to do it well is something else altogether. Babylon 5 was such a series, which ran its intended five years and managed to tell a compulsively watchable story that hangs together incredibly well. This six-disc set collects the fourth of the five seasons in an action-packed drama that is among the finest in television history. The Babylon 5 space station, having declared independence from the increasingly fascist Earth, is caught in the middle of the Shadow War, as the mysterious Shadows ravage planet after planet. The ancient Vorlon race at last decides to get involved, but not in a way that the B5 crew expects. The Centauri empire is coming unglued as Londo Mollari (Peter Jurasik) has to find a way to deal with the utterly mad Emperor Cartagia (Wortham Krimmer), who brings the homeworld into harm's way by inviting the Shadows to use it as a base, while Delenn (Mira Furlan) must face a civil war on her home planet of Minbar. Soon Babylon 5 captain John Sheridan (Bruce Boxleitner) is left with no alternative other than open warfare with Earth, with whatever allies he can scrape together as the series reaches its surprising climax. For the most part, the fourth season is just one huge continuous story; there are only two more or less standalone episodes, and even then one of them has serious repercussions in the B5 universe. It helps that the entire fourth season (like the third) was written by creator J. Michael Straczynski. The flow from episode to episode is such that it's difficult to break off a viewing as matters get ever more tense in the dual wars being fought by Babylon 5 and its crew. There's also plenty of unusual television fare here, such as Intersections in Real Time, which takes place almost entirely in an interrogation/reeducation chamber, or The Illusion of Truth, which is a vicious satire on media manipulation that will bring to mind certain news networks that purport to fairness and balance. Where Vir Cotto (Stephen Furst) really blossoms in the third season, in Season Four it's Commander Susan Ivanova's turn. Having spent much of the past seasons held back or being second banana, Ivanova really takes center stage here, especially since Sheridan is occupied elsewhere on several occasions during this season. Her relationship also deepens with Marcus Cole (Jason Carter) in a believable and poignant manner. The character work, as usual, is excellent, particularly the difficult relationship between Mollari and G'Kar, the Narn ambassador (Andreas Katsulas). Other than a slightly saggy segment setting up a mystery that surrounds Security Chief Michael Garibaldi (Jerry Doyle), there's not a clunker in the bunch of 22 episodes. The best tend to be the most action-oriented, where the various wars turn into real nail-biters both from a military and political standpoint. What the series does particularly well is set up the notion that political decisions have ramifications and emphasizing the role that individuals can play in forming policy, a particularly important theme in days of utter apathy. Among the best episodes are episode five, The Long Night; episode fifteen, No Surrender, No Retreat; episode seventeen, The Face of the Enemy; episode nineteen, Between Darkness and Light and episode twenty, Endgame. There's also a two-episode coda to the season, instead of the obligatory cliffhanger. The last episode is a devastating satire of historians and academicians, The Deconstruction of Falling Stars, as the events of the last few seasons are taken apart from perspectives of 100, 500, and 1000 years after the fact and distorted to suit particular academic, theological or political agendas. Those who spent too much time in college will find this highly entertaining and right on the money. It's quite utterly unlike any episodic television before or since, and an amazing little piece of work in and of itself. 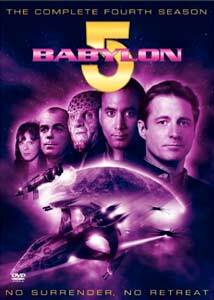 Anyone who has enjoyed the first three seasons will definitely want to own this package; Babylon 5 is densely layered, with things that seemed incidental several seasons ago coming back here to play a significant role. This is not, however, a good jumping on point for new viewers, since little of the past events and relationships is explained and getting much out of the program would be difficult without the background that has been so elaborately laid. The CGI effects work, particularly of the space stations and aerial space combat, just continues to look better and better. Interaction of characters with effects work is less happy, with a good deal of visible artifacting introduced in the process photography. On larger screens much of that will look pretty poor. But on the whole, the effects work is surprisingly good for episodic television and much of it still holds up well today. Image Transfer Review: The video quality of this anamorphic widescreen presentation is uneven, depending heavily on the quality of the occasionally iffy effects work. Disregarding the process shots that are dupey and ugly, for the most part the picture looks quite decent. Aliasing and video artifacting are present, however, and there is abundant edge enhancement putting rings around everything. On the other hand, color is very vibrant and black levels are excellent, with good contrast range. For television, it's pretty good. Audio Transfer Review: There's only one audio track, a 5.1 remix of the original Dolby Surround, but it's an amazing track with an appropriately enormous soundstage that any basshead will want to have. The space combats disregard the silence of space for a gut-wrenching rumble as engines kick in. Even the closing theme has tremendous amounts of low bass. But the real champion is the destruction of the Isle of Celini in episode six, Into the Fire. I'd never before bottomed out my SVS subwoofer even on famously bass-heavy discs like Toy Story 2, but this moment shook, rattled and rolled the entire house in the most extraordinary prolonged bit of bass overload I've ever run across. I'm not sure exactly how deep and how loud this goes, but I was playing well below reference when it threatened to take down the place around my ears. Having recovered from that, I can say that the dialogue is quite clear although there is some occasional minor hiss (the only thing keeping this from an A+ grade). But there's plenty of impact here for those looking for a high-octane audio experience. Extras Review: The usual set of decent extras are provided here. A cast commentary graces episode four, Falling Toward Apotheosis. The foursome tends to alternate segments of silence with all of them talking at once, but it's a fairly entertaining and light-hearted little track. Straczynski contributes a commentary to episodes seventeen, The Face of the Enemy and The Deconstruction of Falling Stars (the former with director Michael Vejar). These are pretty informative, although Vejar adds little beyond saying how great it was to work with various cast members. Straczynski is highly articulate and opens up the writer's mind to clearly demonstrate where he was intending to go with various stories as well as detailing various influences. Commentaries on every episode would have been too much information, but three is a pretty good compromise. Unlike commentaries in earlier volumes, Straczynski refrains from spoilers for the last season. The final disc also includes a featurette (5m:44s) on composer Christopher Franke, formerly of Tangerine Dream, and his work on the series. A DVD suite (6m:49s) consists of short clips from the fourth season set to Franke's music and makes for a nice overview to conclude the viewing of the set and to mull briefly over how far the characters have come in 22 episodes. Hidden as an easter egg is a brief (:33s) comparison of the unfinished CGI and a completed shot of the station. Dispensable profiles of a few characters not previously covered in other sets (Lyta Alexander, Kosh II, Naroon, and Lorien) and a few nonhuman entities (the Voice of Resistance, Proxima 3, Edgars Industries, the Mars Resistance, and the Battle for Earth) are included but add little to the experience. Bios of producer Douglas Netter and Straczynski are included, along with a short (3m:26s) gag reel of actors blowing their lines. All obscenties are bleeped out here. There are also full-frame "next episode" bumpers on the Episode pages, and a convenient "Play All" feature that happily allows you to immerse yourself in the world of B5 for nearly three hours per disc. This is pretty much everything one could reasonably want on such a set. The popular space saga hits its fourth act with a bang and never lets go all the way through. The set sports a decent video transfer and some reasonably good extras, and a killer audio track that will challenge even the best subwoofers.